Open plan dining/lounge/kitchen adjacent to two outdoor decks (Gas BBQ supplied). Kitchen has a well stocked pantry (just replace what you use). House is double glazed (not second bedroom). Guests have use of a reserve 200 metres away that is not available for public access from the shore. 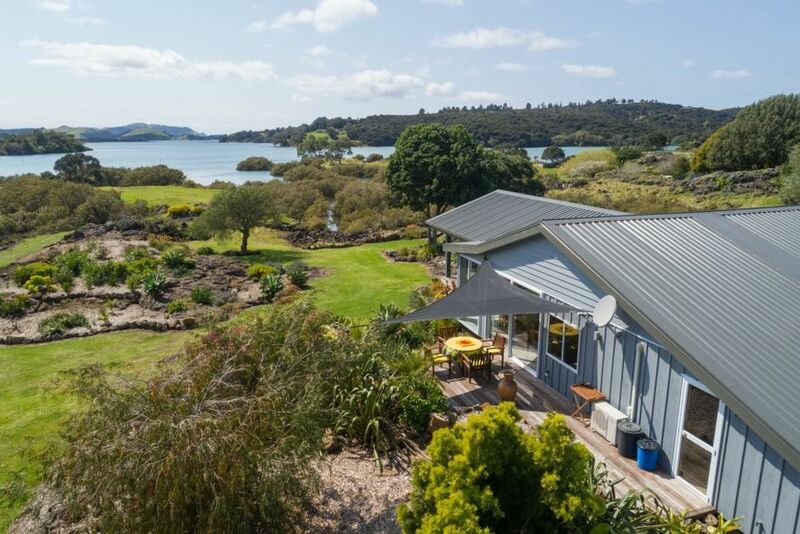 9.5 Km from Kerikeri on a private road of 17 houses. Light interiors, coastal theme with tile floors (second bedroom carpet). Separate Cottage (sleeps up to five, 30 metres away. Has en-suite bathroom & kitchenette). Property has mature Puriri, Pohutukawa, Olive and pepper tree (a member of the cashew family that produces pink peppercorns. Although graphic shows no children, they are fine provided there is water very close to the house (not fenced) and the lush tropical grounds contain many volcanic rocks and plants with prickles/thorns. Therefore children are fine provided they are under continuous supervision outside. Also the Lanai has a 700mm (two foot) drop to the adjacent garden beds. An exit clean is included in the rental price but there is no daily cleaning. Property is OK for children aged 5+. Younger children must be supervised at all times outside as half the property is close to water with numerous access points andamp; is not fenced. Also the landscaping which is tropical has numerous spikes/thorney species/roses. The property is suitable for small weddings/anniversaries but as we are a quiet rural setting with neighbours 100 metres away on either side, outdoor noise must abate by 10pm. Unique waterfront peninsular in a quiet waterfront setting with no neighbours visible - we don't even bother with curtains/blinds in the dining/lounge areas! Superb location and houses. Great set up for groups. Even when it rained you could just sit outside on the covered deck and admire the view. Very quiet and private. Would love to stay again.